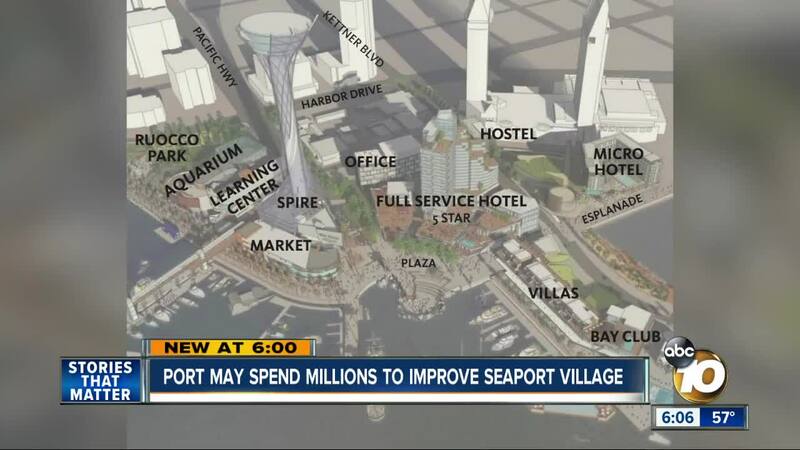 SAN DIEGO (KGTV) — The Port of San Diego may spend roughly $2.3 million to try to break the perception that Seaport Village is shutting down. The aging, quaint waterfront center currently has 18 shuttered stores, mainly on its less visited east side. The mall is known for its souvenir and specialty shops, but has seen declining foot traffic in recent years. Seaport Village is in store for a major redevelopment that could include a spire, hotels and an aquarium. The project, however, is five to seven years away. On Tuesday, the Port's Board of Directors will hear an initial proposal to spend $2.3 million to revitalize the mall for the time being. Seaport Village could get new paint, landscape and lighting, plus improvements to its roofing and air conditioning. Those could attract new tenants. The Port could also seek live entertainment and things such as art shows to increase foot traffic. "It's understandable they want to make it better and they want to make it so people come and enjoy it," said Barry Watson, a downtown resident who passed through the mall Friday. Multiple shop workers who declined to give their names said the vacancies are because the Port of San Diego raised rents 30 percent after it took over management of the property in October. However, a port spokeswoman says those initial offers were based on limited information and that it worked with tenants in good standing to keep them. If the Port's board appears to be in favor of the proposal on Tuesday, Port staff could come back with a formal plan for approval in April.